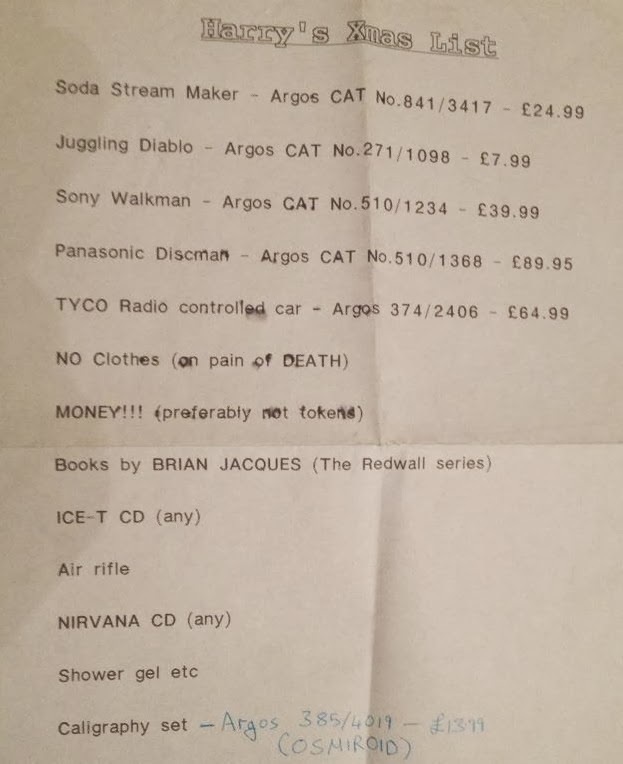 I do love childrens' Christmas lists, and mine was no different. I would feverishly go through the Argos catalogue, pen in hand, and very carefully write down the product numbers of the things I wanted. I would make the list as big as possible, hoping that I would get spoiled rotten but deep down knowing that the budget was £50. 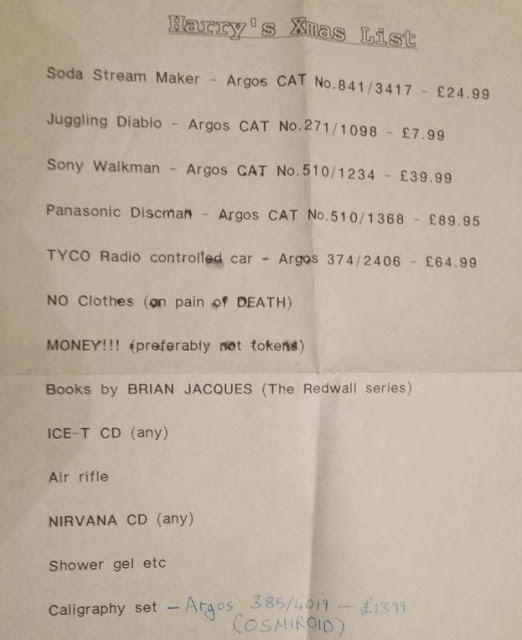 I think this list was from when I was about 11 years old, so it was made in 1993. I was really happy and surprised when my mum gave it to me recently, as I didn't know she had kept it. It was typed up on an old Brother word processor, I remember it well. 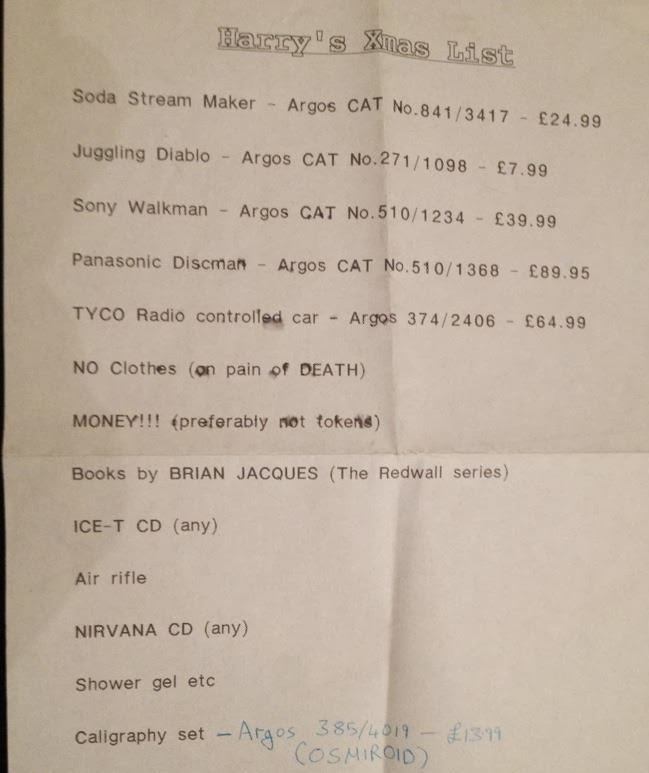 That year, I got the juggling diablo, the Redwall books and the Discman. I'm sure I got clothes too, so I don't think my death threat carried much weight. The present I really wanted was the air rifle. It would go on the list every year but I never got one. It was probably for the best! Now tell me, what was the present you always wanted but never received? It's so brilliant that your Mum kept this! I'd love to see some of my past Christmas lists. Well done on procuring the discman because it was clearly out of budget haha.